lol, this awkward father and son. Kenshin tried so hard |D but Kagekatsu seemed oblivious to that LOL just minding his own business and enjoying his father’s presence. HAHA did you get marks taken off for not having elaborate answers? Or technically it was all within what you were being graded on because you were answering the questions correctly? /o\ I’ve always hated speaking parts in language classes because while I understand that they’re there to help you get used to talking in the language, by nature I’m not a very talkative person in real life to people I don’t know. When English conversations usually devolve into me going “Oh, I see. That’s cool. Wow. Ohh. Interesting…” that’s usually what I sound like in other languages too LOL. Maybe Kagekatsu was real nervous there. Poor Kenshin, he has to learn to ask question that cannot be answered with “yes” or “no”. You’re welcome \o/ it’s all thanks to Cheek Rubsu too! 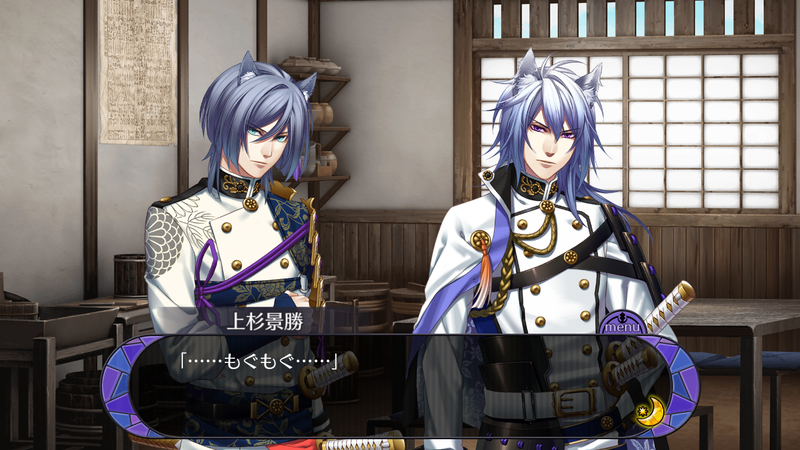 Haha, it’s hard to tell when Kagekatsu’s so quiet and rarely shows his emotions on his face |D but yeah poor Kenshin trying to make conversation, especially when I feel like he’s a person who barely talks himself? LOL I mean the heroine had the impression that Kenshin was cold and curt at the beginning so… I don’t think he’s naturally good at making conversation |D. I had trouble understanding what Kenshin says in his inner monologue ‘cause google translate… The only thing that gave me any clue was the tone and awkward hesitation in his voice lmao. That aside, this was the only 2-star card I managed to get of Kenshin. ; u ; My luck is terrible. Anyway, I’m glad to know that Kenshin is willing to meet Kagekatsu halfway in building a healthy parent-child relationship. Eheh, you’re welcome and thank you for the commission <3!! In general, Kenshin likes to speak with older conjugations I feel so that might trip up google translate too :')) he's such a deep thinker too and look at him ponder all these things with Kagekatsu, ahaha. Oh no, it's so awful when the cards you want never come to you. I remember grinding through the main levels to collect all these 2* cards (if I couldn't get them through the coin one or got bored of trying to spam down my coins lmao). I wonder too ;;;; Kenshin said Kagekatsu is his nephew but it sounded like his sister was alive so /o\ I wonder if he adopted Kagekatsu because he himself doesn’t have a heir yet. But I feel like they’d always have an awkward air because they have to acknowledge that Kenshin is still the general and Kagekatsu is a subordinate under him, even if they’re related. And then adding onto that Kagekatsu’s role and pressure as heir to Uesugi… /o\. But tbh this event felt more like it was just Kenshin overthinking things and feeling awkward while Kagekatsu was just quietly enjoying their time together LOL. Historically, Kagekatsu was adopted by Kenshin to be his heir when he was very young, probably around 7-8 years old, and yes his biological parents were still alive that time; it wasn’t strange for samurai to adopt heirs that aren’t their actual children during those days, in Kenshin’s case he didn’t have heirs because he never married. 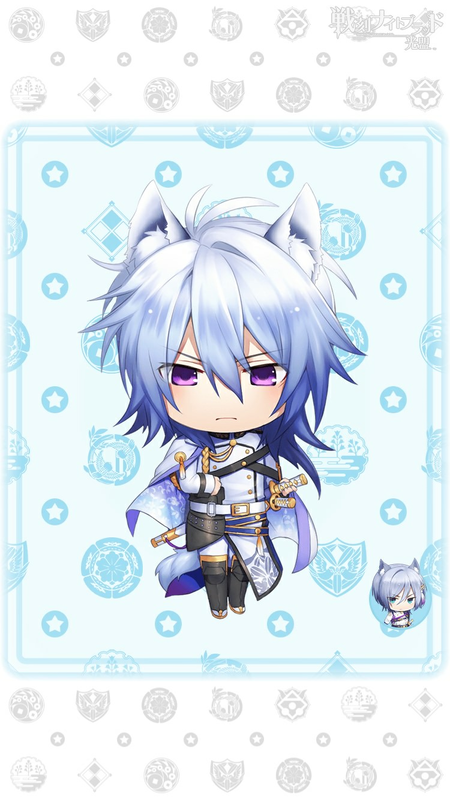 ^^ But Senbura may have made Kagekatsu’s adoption age a bit older than it is, hence the slightly awkward air between them here. But Kenshin trying his best to be a real father to Kagekatsu is just so heartwarming to watch, he takes it just as seriously as his duties as the Uesugi general. Ooh, that’d be nice. I actually haven’t checked out the 2* cards for a lot of the characters (only the leaders so far whenever I’m collecting their interaction scenes) so maybe Kagekatsu will have one that his perspective on Kenshin, though maybe not of the same scene. Knowing how quiet he seems to be in general with the heroine I think he’s enjoying it too |D he’s just the quiet type and it’s Kenshin who’s reading into things more than he should, ahaha. It’s cute seeing Kenshin take on a fatherly role though at the same time kinda weird when you see them both going after the heroine L O L unless you read Kagekatsu and the heroine’s relationship being more mother-child. it’s like a baby saying his first word. i can understand why KAGEKATSU feels awkward. KENSHIN, you got to be informal i mean, you still act as noble general. eating in restaurant is a good start. I actually didn’t think Kagekatsu was awkward LOL he’s just normally super quiet and it was Kenshin who had a hard time reading him and realizing that just because someone’s quiet doesn’t mean they’re not enjoying your presence and this outing |D. For however talkative I appear online, I’m pretty quiet in real life like Kagekatsu so I can understand him, ahaha.